Arthritis Supplies is proud to supply customers with high quality visual aids designed and manufactured by UltraOptix. Compact magnifier with LED light for reading small print. Full sheet magnification aid with additional bifocal insets. 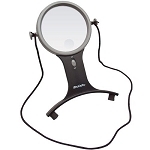 Handheld pocket magnifier with easy grip handle.